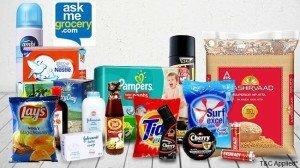 Askmegrocery.com is India’s fastest growing online grocery shopping portal that aims at fulfilling your daily grocery requirements and brings to you a gamut of products ranging from staples, dairy products, personal care products to other household utilities and thousands of brands. Now get Flat Rs.80 off on groceries worth Rs.400 or more + in addition get 10% cashback via Mobikwik. Recently askmegrocery were offering Rs.500 off on orders of Rs.1500 by just referring 3 friends. Both offers are best when it comes to daily essential shoppings. Keep ordering! Browse through the offers & Deals Present (We have also added some offer links below). Choose desired product in your Cart (Build your cart now and checkout later). Proceed to Pay and Apply Coupon – ‘FLAT80’ to get Rs.80 off instantly. Get 10% cashback on AskMeGrocery when you pay through MobiKwik. Maximum MobiKwik cashback is Rs. 200. Offer is valid on AskMeGrocery. If the order is cancelled or left undelivered at merchant’s end, the merchant (not MobiKwik) will initiate a refund.After the refund is initiated, amount will be credited back to wallet within 7-10 days.